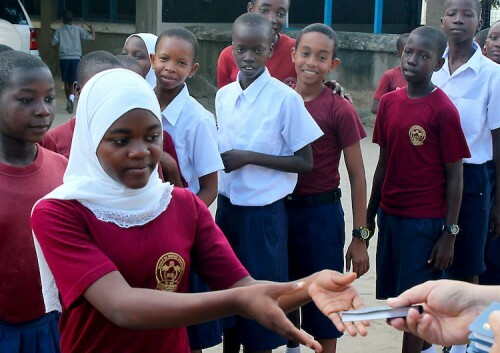 A student receives one of the 313,000+ Scriptures distributed by Gideons during the 2015 Tanzania International Scripture Blitz. © 2015 The Gideons International. Tanzania is located in East Africa and best known for Mount Kilimanjaro, the highest peak on the continent. This February, Gideons also reached great heights in the distribution of over 313,000 Scriptures throughout the communities of Tanzania. Over 1,000 Gideons serve in more than 70 camps in Tanzania. Members in the city of Dar es Salaam were joined by visiting Gideons from eight other countries. Isaack, a Gideon from Shinyanga in western Tanzania, traveled 12 hours by bus to join the team’s efforts in reaching his country for Christ. The dirt roads in Tanzania often make traveling to distributions a challenge, but Gideons viewed these as opportunities to share God’s Word. “While stuck in traffic, two policemen on motorcycles driving alongside us asked for Scriptures. Since we were sitting still in traffic, a few of us gladly jumped out of the car and gave the officers Scriptures. We noticed others on the side of the road and also took the opportunity to share a word of witness and a Personal Workers Testament,” said Larry Vangilder, a Gideon visiting from Missouri. School children in Tanzania share their Scriptures with friends after a distribution. Tanzania is open to religious freedom. Yet, when Gideons visited schools enrolling both Muslim and Christian students, some teachers separated the students so Muslim children would not feel obligated to take a New Testament. Still, the Christian students who received New Testaments were quick to show their gift to their Muslim friends. Many students pointed out different sections in the book, spending lengths of time explaining the importance of the Scriptures. “The students are so hungry for the Word of God. I will never forget the anticipation in their eyes waiting to receive their very own copy of God’s Word,” said Noble Roberts, a Gideon from North Carolina. By the end of the blitz, team members had visited 584 schools and distributed over 277,800 Scriptures to students. During their journey to different cities, the team was blessed by the stories from those who had received Scriptures from Gideons years ago and had since come to know the Lord. Shadrack Sanga received a New Testament from Gideons in 2007. After reading it for the first time, he knew with all he had learned and experienced in the reading of God’s Word, his heart must be surrendered to Jesus. Sanga carries the New Testament everywhere and often shares Jesus with others using the same New Testament. “I can’t find enough words to satisfy my heart in thanking Gideons for the work they do,” he said. One of the young drivers for the blitz, Sam, was inspired by the good work he saw Gideons investing in during the week. Team member Jeff Brown shared, “After traveling with the team all week, and seeing what the Lord was doing in his country, Sam heard God tell him to share Jesus with his father. While the Gideons prayed from afar, Sam led his father to Jesus.” Before the end of the Scripture blitz, Sam signed an application to become a Gideon himself. He plans to continue the good work of spreading the Gospel in his city. God remains faithful in Tanzania. Before beginning the Scripture blitz, teams were prepared to go out and bless others with the Gospel. However, in the end, team members agreed they had been the ones blessed by the joy and positive response of the people of Tanzania to hear about Jesus Christ. Continue to pray for the many people who now have God’s Word in their lives—that they would read about His love for them and accept His gift of salvation. I love Jesus, he saved me. YES. We instinctively know that our giving the word will bless others. But God is good and gives us blessings in return as recipients receive the gift of life along with the book. Thank You God for Tanzania Blitz. God bless you Tanzania Blitz team! A powerful testimony. I spent two weeks in Moldova and was able to present Bibles to some key officials in the country. What a privilege to share God’s word (Mark 4:14). Thank you for 125+ years of service. Thank God for what started with 3 men with a vision from God! His Word is a lamp unto our feet and a light unto our path (Ps 119:105)! It’s always that way, isn’t it? We set out to bless the Lord because of our love for Him, and He turns the blessing back toward us. Praise You, Lord! Praise the Lord! May God bless His Word as He has promised in Isaiah 55:11!! I commend this noble ministry. You are doing a good job reaching many for Christ. I would like to be a Gideon also. Would you please let me how? I am a life member and former Area Director of Gideons International in India.Could you help me to get some PWT in Swahili language for the distribution.